In the mid-eighties, thanks to the help of the Valle d’Aosta region and to the Municipality of Ayas for granting the land, some local mountaineers began their new project: building the highest mountain hut in the Ayas valley. The Ayas Guides Hut, inaugurated in September 1991, is located at an altitude of 3400m just above the rocky slopes called Lambronecca. It is about an hour hike from Rifugio Mezzalama, a much older hut located lower down in the valley. The Ayas Guides hut is a modern and functional place to sleep and eat, with a total of 80 beds. 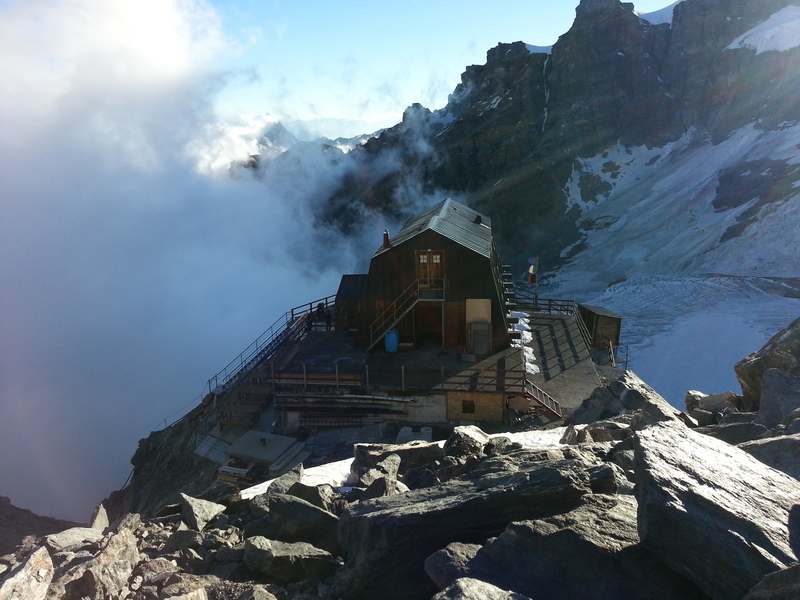 The hut is now an essential place for traveling alpinists visiting the glacier to stay, eat and rest comfortably. Run by Federico and Livio, the refuge is open all summer long and also briefly in the spring season. From Champoluc-St. Jacques, leave the car in the Church square and continue to Blanchard, where the trail No. 7 starts. Cross the bridge and head towards the forest to join the path to the Pian di Verra Inferiore. Once you’ve crossed the large plain, you will find the yellow signs which indicate the Lago Blu, the Mezzalama Hut and the Guide Ayas Hut. You cross the bridge and follow the trail to Pian di Verra Superiore. Shortly before,the trail disappears to the left and rises up the steep slope of the glacier morain. Follow the ridge and you will see the Mezzalama Hut (3004m); higher up also see the Guide Ayas Hut perched on a large rock mass. The Guide Ayas Hut is visible on the Rocks of Lambronecca and the ascension is on its right side, on the Verra Glacier. You cross the lower section to the right and climb up the final part (equipped with ropes and railings in the last meters) which allows arrival at the hut.